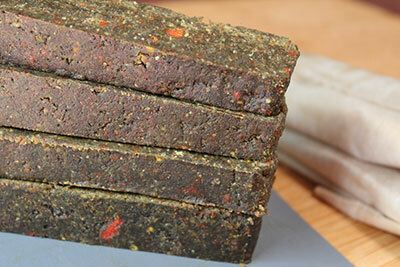 Making a homemade protein bar recipe is a great way to control what ingredients go into your bar. Sometimes, it is convenient to buy commercial brands, but really, the best protein bar is the one you make yourself with foods that you can trust to provide you with a high quality concentrated source of protein. What this means for those of you who eat protein bars on a regular basis is that you get to select healthy, gluten-free, low glycemic, whole food ingredients and create something better for long term health. Protein bar sales in stores have hit an all time high these days. People are on the go and want something fast and easy to grab as a quick meal. However, the energy bars out there, albeit "fast and easy", offer little as far as "real nutrition." Not only that, commercial protein bars have been sitting on a shelf for months or even years in some cases. We personally try to stay away from packaged foods as much as we can, especially products with preservatives and long lists of substances you can't pronounce. You also have to be careful when purchasing some brands as they are packed full of sugar and trans fats, becoming nothing more than a glorified candy bar. Even the healthier, raw vegan versions, though much better, are nothing compared to what your can put together in your own kitchen. Plus, they are way overpriced for the tiny little bar you actually get. 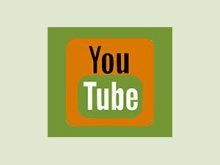 Here, we like to make our own raw vegan recipes for way less money using high quality organic ingredients. 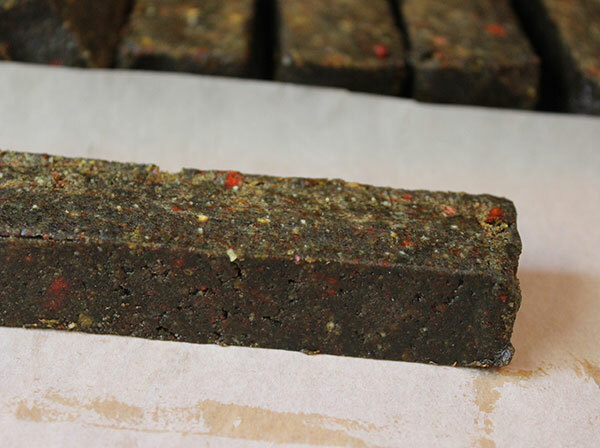 The best protein bars are made fresh, using top nutrient dense superfoods and natural sugars. 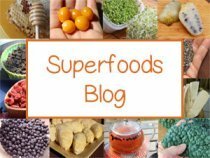 Here we offer our much loved protein bar recipe that includes some of our favorite superfoods in addition to low glycemic sweeteners, like stevia and coconut nectar, plus a combination of brazil nuts, hemp seeds, chia and pumpkin seeds. Because these are raw bars, that is to say that no baking is involved, certain ingredients are necessary for producing "just the right" texture. This process involves the use of a high speed blender and food processor (at least to make it the way we do). We use the blender for grinding up the nuts, seeds and goji into a "flour" before adding them to the final stage of processing. This creates a smooth, chewy textured protein bar that is easier to digest and more pleasant to eat. 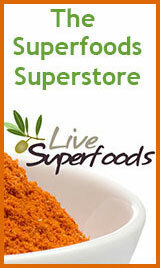 As another option you can also purchase nuts, seeds or goji flour that is already pre-ground. Typically, we usually soak chia seeds before using them in recipes, but in this case they actually help to firm up the moisture content present and assist in creating a nice consistency. It is always important when making homemade bars to make sure they have a good amount of fiber content. This makes them easier to break down and assimilate, giving you the energy requirements you need for being physically active. Fibrous foods also help to slow down the digestive process and act as natural appetite suppressants. 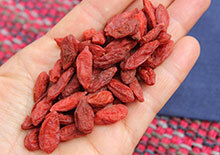 In our recipe we use ground goji berries. The goji is a super fruit variety that happens to be both high in fiber as well as protein (quite rare for a fruit). The dried fruit also helps to supply a natural sweetness to the recipe so we can use less of other sugars. Chia and hemp are two great fiber-rich seeds. Chia seeds are known as an "endurance food" and help to supply nourishment in a time released fashion. In addition, chia and hemp seeds are all high in the hard to find omega-3 fatty acid. It is important when using other nuts, seeds and ingredients high in omega-6 that you try to balance out the ratio with more omega-3's. 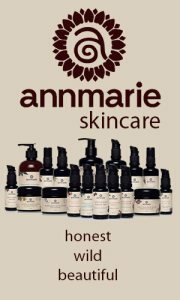 Too much omega-6 can cause inflammation in the body and other related health conditions. A good balance to try to adhere to is a 4:1 ratio. This means that for the amount of omega-6 foods you consume you would need to eat at least 1/4 of that amount in omega-3's. What About the Protein in This Protein Bar Recipe? 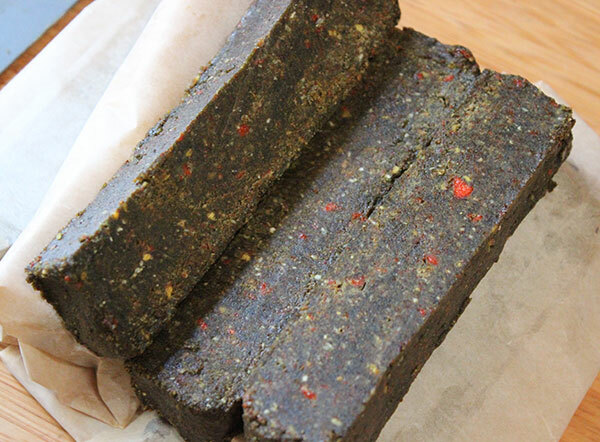 The main sources of protein for these bars are hemp seeds, bee pollen, spirulina, pumpkin seeds, raw protein powder, brazil nuts, goji and chia. 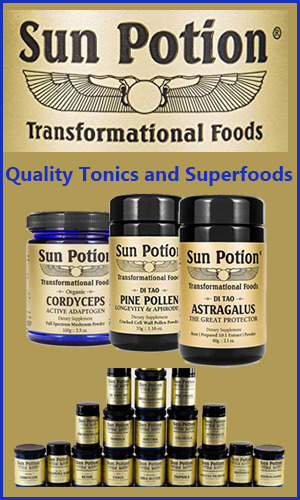 Spirulina algae and bee pollen are two of the most protein-dense superfoods around. Spirulina is one of the first living plant forms on planet earth and is incredibly efficient at converting sunlight into concentrated amounts of protein, containing an average of about 60%. 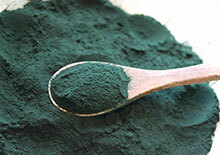 Dried spirulina powder is also a great source of chlorophyll and minerals. Bee pollen is additionally very high in protein content plus tons of nutrients and beneficial enzymes that aid the digestive process. As mentioned goji is a fruit unusually high in protein (13%) and chia seed is about 30% protein along with 19 amino acids, including all 9 essential amino's needed by the body for proper muscle growth, tissue repair and many other bodily functions. Hemp seeds are definitely the top seed for protein quantity and are one of the best sources of easily digestible plant protein above all nut and seed varieties. Brazil nuts and, of course, "protein powder" also add significantly to the protein content of this recipe. Coconut oil is an energy burning fuel source that is an easily digested medium chain fatty acid. 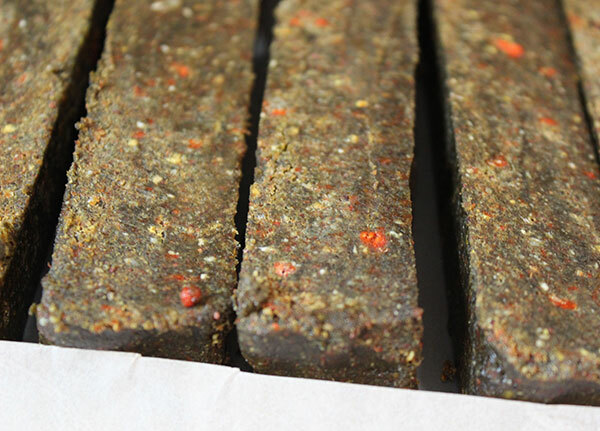 Maca is about 14.6% protein and provides an energizing addition to this protein bar recipe, along with raw cacao (chocolate) and the herbal stimulant ginger. There are several ways to create your protein bars. You can use a square dish mold, roll into logs and slice (like our cinnamon roll recipe below), or form by hand into a large square that you can make even with a frosting spatula or other kitchen tool. Our protein bars are a nutritionally dense protein-rich food that can provide energy to burn for many hours. They are perfect after or before a workout session or can be enjoyed between meals for an energy boosting snack. They are very filling! One bar usually satisfies the appetite and keeps you moving until your next meal. 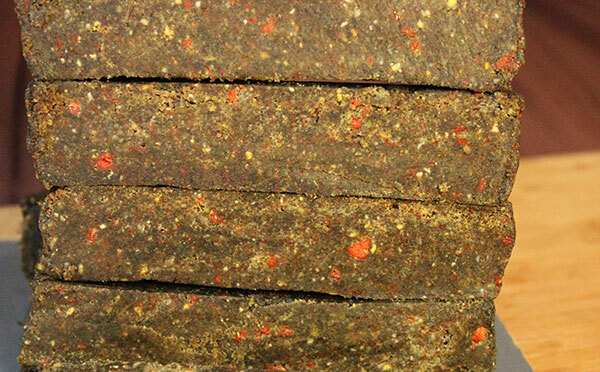 In a high speed blender make your "flours" from dry hemp seeds, goji berries, pumpkin seeds, coconut, chia and brazil nuts. 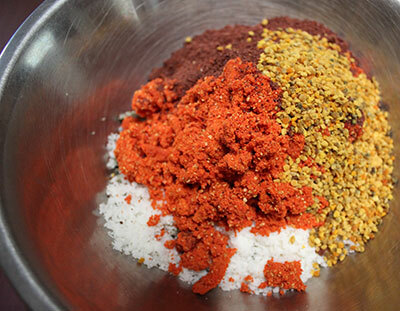 Place all dry ingredients in a big bowl and mix. Add the oil, cacao butter and sweetener. Process this mixture briefly in a food processor adding enough water (but not too much) to create a dough-type consistency. Let this mix sit in a bowl in the fridge for an hour. This will help it to firm up and allow the chia to absorb some of the moisture content. Cut up into desirable widths and place covered in the freezer for 2-3 hours. 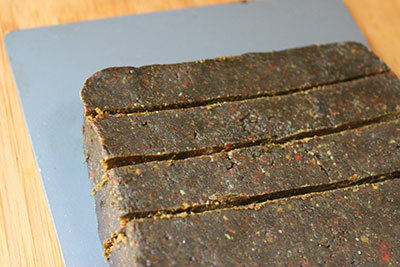 When you make this raw protein bar recipe you can add and make adjustments as desired. The key is to make sure you have a dough-like consistency that will set when cooled over a few hours time. Wrap up each bar individually in wax paper, so you have them ready for travel. Store them in the fridge or freezer, they will last a week or two when kept cold. You can replace the cacao powder with carob powder, using the same proportions, if you are at all sensitive to raw cacao. We often used soaked and dehydrated pumpkin seeds to remove some of the phytic acid content, however, this process is not totally necessary if you are short on time. 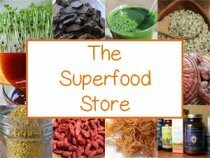 You can also add other ingredients to this protein bar recipe, like medicinal mushrooms, astragalus (powder or extract), sacha inchi protein powder and other algae's.